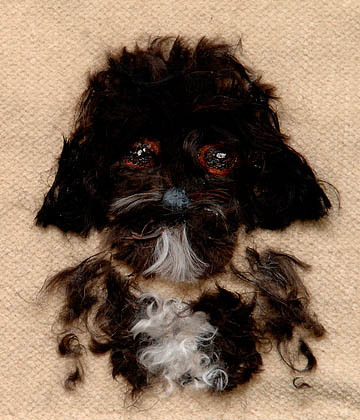 In some instances, it is possible for me to create a likeness of your dog’s face and chest using your pet’s own hair mounted on a woven background. 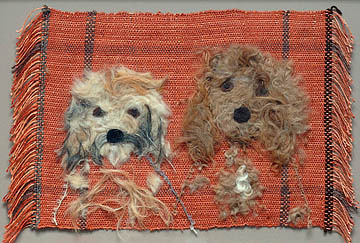 This process is best suited for dogs whose hair is not one uniform color. Examples of the breeds for which this process works well are wheaton terrriers, Tibetan terriers, Portuguese water dogs, shih-tzus, and poodle mixes. The pricing and policies are much the same as those for an oil painting. One important difference is that, once the size has been determined, it is your responsibility to provide me with a shadow box in which to place the finished portrait. It is important that you give me the box before I begin work, so that the background color of the piece will resonate well with the frame. Once I see your dog, I can make recommendations about the color of the shadow box. Perhaps the most significant difference between this process and an oil painting is that, after your dog has been groomed and is still clean, I will need to snip off pieces of his or her hair to be used in the portrait. Unlike an oil painting, this type of portrait therefore cannot be done long distance via a photo. Depending on the dog, this procedure may result in a few uneven blotches until the hair grows back in. In cutting the hair, I have never hurt a dog. If you have questions about this type of portrait, please feel free to contact me.